Mark and I were both raised on Appalachian green beans --- pole beans, picked when they're so big they have half inch seeds inside, then boiled into submission (sometimes for hours) with bacon. Then we met Masai beans and fell in love. 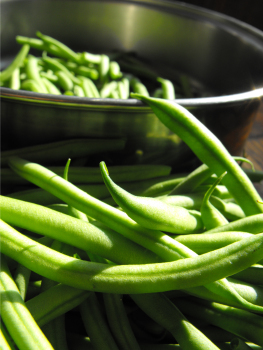 These heirloom, French-style green beans are all we'll eat now, first and foremost for their exquisite flavor. The tiny beans are sweet and stringless, so I usually just break them in half and steam them for three minutes, or toss them in a skillet with garlic for a few minutes. Either way, they are phenomenal. Masai beans also freeze extremely well --- we froze four and a half gallons last year and wished we'd had twice that many. Of course, Masai beans are also a pleasure to grow. First, they're heirlooms, so you never have to pay for seeds again. They're bush beans, too, which means the plants produce big crops all at once without a trellis. But unlike most bush beans, they just keep producing big crops all summer, so there's no need to succession plant. (I do succession plant, but only because I like to have lots of beds and it's easier to start them scattered throughout the summer.) The clincher is that they seem to be relatively immune to bean beetles. Try them out and I suspect you'll write your own ode to Masai Beans next summer. Do you think I could get away with planting some right now as a fall crop? Would they have time to mature enough for me to get some beans for next year's crop planting? Where should I order them from? You can probably squeeze them in if you plant them right now --- I'm putting in one last planting this week. I've had good luck with Park Seed --- http://www.parkseed.com/gardening/PD/5719/. I hope you like them as much as I do! I just tried them this year and yes, this will now be the ONLY string bean I will grow. Without a doubt the best I have ever tasted. I really love this dwarf variety! I'm not sure I'd call them a string bean --- their stringless nature is one of Masai beans' selling points. But I totally agree with everything else! Still our favorite (and only) green bean two years later. Hi- Where did you get seed for this variety originally- sounds like you are saving your own from year to year now. I would like to try it out. Thanks for your blog, I really enjoy your down to earth-ness and detail.